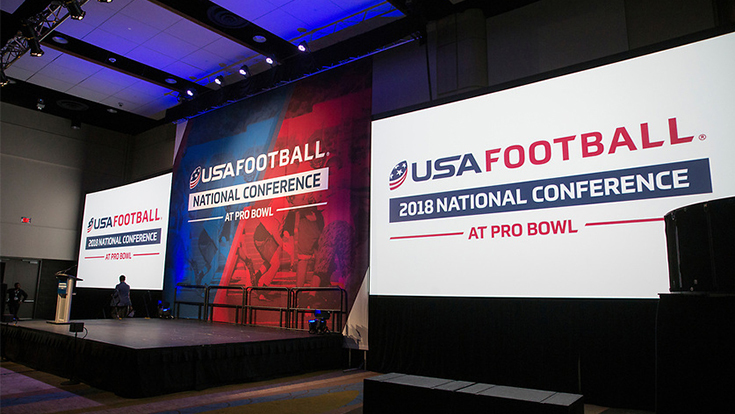 USA Football’s National Conference is the event for you. Now in its eighth year, the opportunities to come together, network and learn with your peers are unlimited. This is the ultimate football conference — but don’t just take our word for it. Check out what fellow coaches and administrators had to say about attending the Conference in the multi-part series, "National Conference: Why I Attend." Administrator of the Hill City Youth Football and Cheerleading Association, Carla Garrett is a previous attendee of USA Football’s National Conference. Though she has only been to one National Conference so far, the event left a big impression. Access to various youth football resources — equipment, website vendors, uniform vendors, etc. Attend for the fellowship first and foremost because it is wonderful to be around people who share your passion. The information gathered from being around just the people is outstanding. Additionally, to attend the various applicable sessions gives a better understanding of the sport, the challenges involved with the sport and the changes and decisions made to sustain and improve the sport. This is not a vacation, but a resource to gather information and perfect our trade. Be prepared to attend various sessions and discuss the topics and issues surrounding football today. Address some of your biggest programmatic challenges and celebrate your biggest wins at the 2019 USA Football National Conference! This one-of-a-kind event is more than just a coaches&apos; clinic. In addition to schemes, drills and techniques, you&apos;ll amp up your team&apos;s performance by discovering topics on leadership, health and safety, and participation.